Stacking games are becoming ever more common, so coming up with an idea that keeps a game fresh is, I imagine, a pretty tough thing to do. 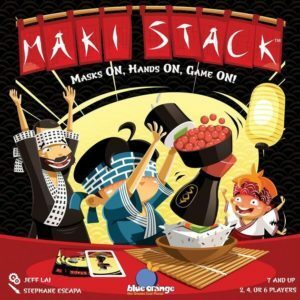 Maki Stack aims to try something new with its Japanese theme leading to the use of “chopsticks” and only letting you stack with a single finger at a time. Yeah. 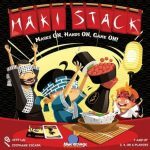 Maki Stack doesn’t muck about when it comes to its own brand of challenge. 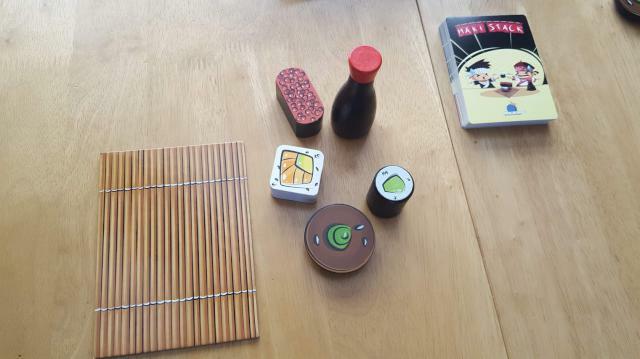 The premise of the game is simple enough, small teams of players buddy up against each other trying to build a stack of sushi pieces, with the points going to the winning team and everything starting again. 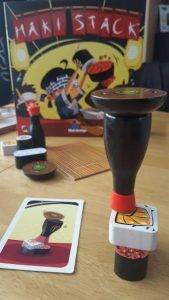 There’s nothing complicated about the rules, but the techniques used to do the stacking are where the interest and fun lies and what makes this different to other games in the genre. The stack required is shown on a card that is taken from the top of the pack. Some cards have a yellow background and have players using an individual finger to stack things up. If that sounds pretty impossible, it depends on how many people are playing. If there are just 2 on a team then one player describes the stack while the other uses only their index fingers (or, for a bigger challenge, their little fingers) to build it up exactly as the other player is describing it. With more players you’ll be working together – one of your index fingers and one of your teammate’s, trying desperately to work together to stack things in the right way without one of you twitching slightly and messing the whole thing up. It’s tougher than it sounds – even doing it yourself using a single finger on each hand is surprisingly tough, so bringing in a second person is a recipe for disaster. Still, it could be worse. You could get a red backed card. Those cards with a red back tend to have slightly smaller stacks. But there’s a good reason for that – someone’s building it up without being able to see. The game comes with two decent sized blindfolds which, while making my eyes sweat a bit (who knew that eyes could do that? ), do an admirable job in blocking out what most people can see. They’re not great for smaller people – my 6 year old was amazingly good at doing this blindfolded until he let slip he could see under it quite easily – but for most players they’ll be comfortable and make life every bit as tricky as you’d expect. The toughest bit isn’t really finding the right piece to use, it’s then getting it onto your stack without sending it flying with a clumsy accidental backhand off the table into someone’s coffee. Not that I did anything like that. On a purely unrelated topic, the stacking components are nice and robust, so that’s nice. The pieces themselves are solid feeling and seem to have held up well to the expected beating against a wooden table, and while any floor droppages landed on carpet I’d be confident that they’d survive landing on something a bit harder if you play above a wooden floor or whatever else. The cards, too, are good quality, feeling strong enough to be handled frequently without tearing or scuffing too much. For this kind of game you want components that feel tough, and you’ll get that with Maki Stack. You might not get the most long-lasting game around, and I severely doubt you’ll want more than a few rounds of this before moving onto something else, but what you will get is a really well thought out, unique stacking game with some interesting play styles that’ll fit pretty much whatever audience you throw at it. The usual caveats apply as with other stacking games obviously; if you don’t have steady hands for whatever reason then this will be a lesson in frustration, and if you’re not one for communication or struggle with speaking or hearing then the idea of someone else dictating the building instructions to you could prove tough. But if you’re a fan of stacking games, are in the market for something you can have fun with alongside your kids, or just want something you can enjoy the family when those ever-so-slightly-too-long family Christmas get-togethers start to drag, then this will sit perfectly on your table.